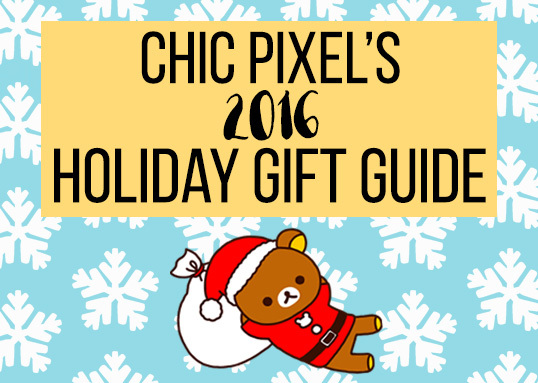 It’s time for the third annual Chic Pixel Holiday Gift Guide! I always really enjoy doing these because I often get ideas for my own personal wish list, so you know everything I include has the official Chic Pixel stamp of approval! 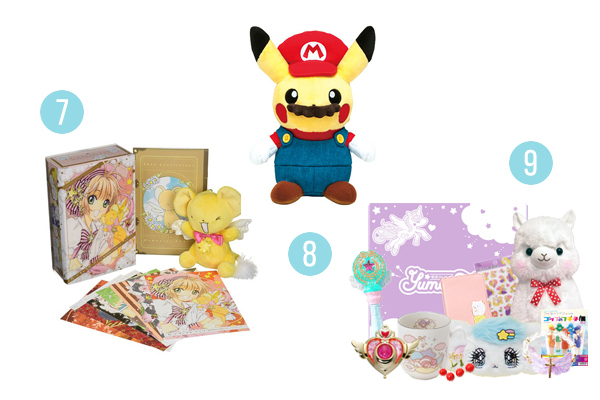 Whether you’re looking for a gift for an otaku, gamer, or fan of all things kawaii, I’ve got you covered in this year’s gift guide. This time around I’ve arranged things in order of price, starting with items on the more expensive side going all the way down to stocking stuffer ideas for under $10. There’s a gift idea for every budget! Before I get started, please note that this post includes some affiliate links. Any purchases made using them will earn me a small commission that goes back to making Chic Pixel bigger and better. You can see a full list of Chic Pixel affiliates on my Support page. 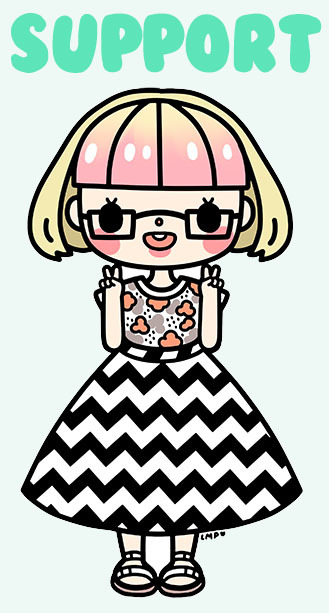 Also, if you’re not yet a member of Tokyo Otaku Mode and would like to get some of your holiday shopping done there, you can sign up using my referral code to get $10 off your first purchase! Finally, if you liked this guide and would like to support Chic Pixel further, click here to learn more. Now, on to the gifts! 1. PlayStation Vita [~$176.94 Amazon JP | ~$183.67 AmiAmi | $206.80 Amazon] – I know what you’re thinking. “Is she seriously recommending the PS Vita in the year of our lord 2016?” Why yes, yes I am! For anyone who likes obscure Japanese games or otome games, the PS Vita is an absolute must. Unfortunately, it also seems to be getting harder and harder to find, so it’s probably something you should jump on now rather than later. The bonus of ordering from Amazon JP, which is the cheapest option but requires a forwarding service such as Tenso, is that you could also grab a few cheap Japanese games at the same time. Remember, the PS Vita is also region free, making it very import friendly, so I highly recommend it to Japanese language learners. If you’re keen to get yourself or your giftee playing Vita games but can’t afford the handheld, the PlayStation TV is just $50 on Amazon. 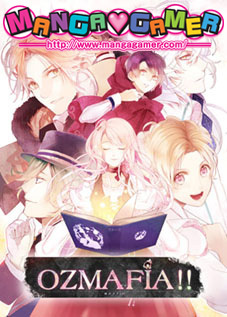 That’s less than a new otome game! 2. The Vision of Escaflowne Blu-ray Complete Series & Movie Collector’s Edition [$179.98 Amazon | $134.99 RightStuf] – The Vision of Escaflowne series and film are finally available on blu-ray, and what better way to commemorate it with this gorgeous limited edition? The LE comes with a special box and exclusive art book, making it a really special package for 90s anime fans. 3. Free! Haruka Nanase 1/8th scale figure by Altair [~$78.51 AmiAmi | $129.00 Jlist | $97.99 Tokyo Otaku Mode] – This wouldn’t be a Chic Pixel gift guide without some cute anime boys, and what better for the cute anime boy fan than some Free! figures? 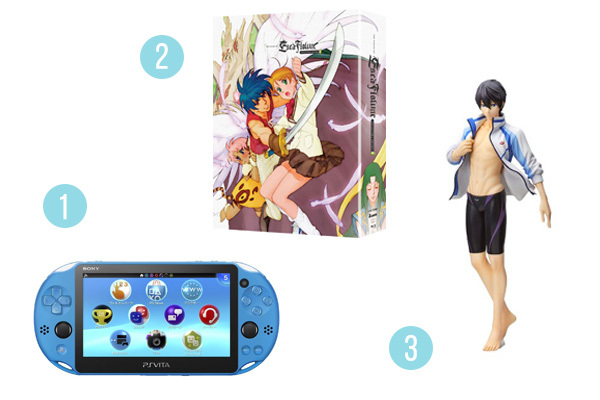 Of course, your giftee’s favorite boy may not be Haruka, in which case there’s also Makoto, Rin, or Sosuke. 4. 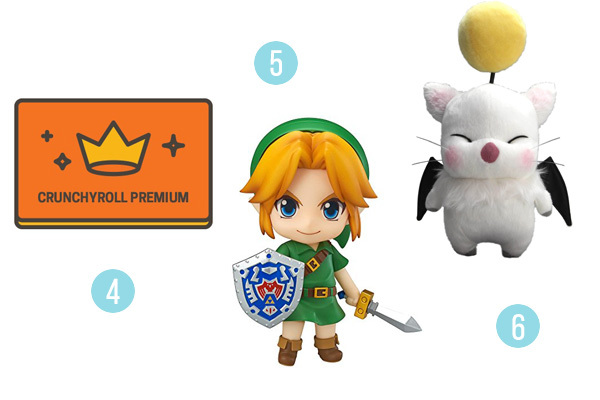 Crunchyroll premium [$59.95 for one year] – What’s better than the gift of anime? Crunchyroll premium subscriptions can be purchased in as low denominations of $6.95 for one month, so there’s really no reason not to get all your friends premium memberships. They’ll be overjoyed with all the anime and manga at their fingertips, and they’ll be supporting the people who make them! 5. Link Nendoroid (Majora’s Mask version) [$49.99 Jlist | $41.82 Tokyo Otaku Mode | ~$22.81 AmiAmi] – The latest Link Nendoroid is out, and this time it’s an adorable take on the Majora’s Mask Link design. I highly recommend Nendoroids as presents regardless of what series they’re from, but I figure there are probably a lot of folks out there who like The Legend of Zelda, which is why I’ve decided to feature this cutie. Alternatively, the very first Zelda Nendoroid just came out this year, and she’d make a wonderful addition to any The Legend of Zelda fan’s collection, too! 6. Final Fantasy XIV: A Realm Reborn Kuplo Kupo moogle plush [$33.80 Jlist | $28.99 Square Enix Online Store] – A moogle plush would make the perfect gift for any Final Fantasy lover, regardless of whether or not they know who Mr. Kuplo Kupo here is. A moogle is a moogle, after all! 7. Cardcaptor Sakura 20th Anniversary Memorial Box [~$33.33 CDJapan | $43.99 Tokyo Otaku Mode] – This lovely box commemorates 20 years of Cardcaptor Sakura with an adorable Kero-chan plush, calendar featuring 5 new illustrations, and a 16 page booklet with an extra bonus manga. For the price, it’s a total steal! 8. Mario or Luigi Pikachu Plush [$32.00 Japan Stuffs] – Pokémon fever is at a high right now with Pokémon Go and Sun/Moon on the horizon… But instead of getting the usual starter Pokémon plush for the Pokéfan in your life, how about a Japan-exclusive Mario or Luigi Pikachu? It’s the ultimate combo of Nintendo greats, and cute to boot! 9. YumeTwins subscription box [$24.99 for one month with code KAWAIIXMAS before Nov 30th] – I absolutely love subscription boxes as gifts! While there are more Japanese snack boxes than you can shake a Pocky stick at, kawaii lifestyle boxes are much fewer in number. YumeTwins, however, fills that void wonderfully! If you need more convincing, check out my review for a detailed look at what you can expect inside. 10. 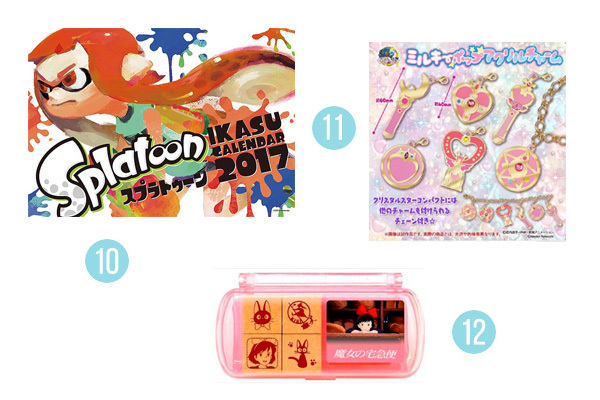 2017 Splatoon calendar [$16.67 CDJapan] – You can’t go wrong with a nice calendar featuring someone’s favorite game or anime. I’d have a hard time choosing between Splatoon or this Pokémon one! 11. Sailor Moon Milky Pop acrylic charms [$19.99 Jlist] – For the Sailor Moon fan who has nearly everything, how about these gorgeous charms? Get the full set of 6 and put them on a charm bracelet, or grab a single random charm for just $3.50 for the perfect stocking stuffer! 12. Kiki’s Delivery Service stamp set [$8.95 Jlist] – These Kiki’s Delivery Service stamps are to die for! Any Kiki, Jiji, or Studio Ghibli fan would thrilled to receive them. They’d be especially fun to use to decorate a planner! 13. Daily Extravagance Kit Kat [$5.00 Jlist | $5.00 Oyatsu Cafe] – The latest in Japanese Kit Kat flavors will be sure to impress any candy fan. These almond and raspberry Kit Kats are inspired by the Chocolatory in Tokyo! It’s the next best thing to visiting it yourself. 14. 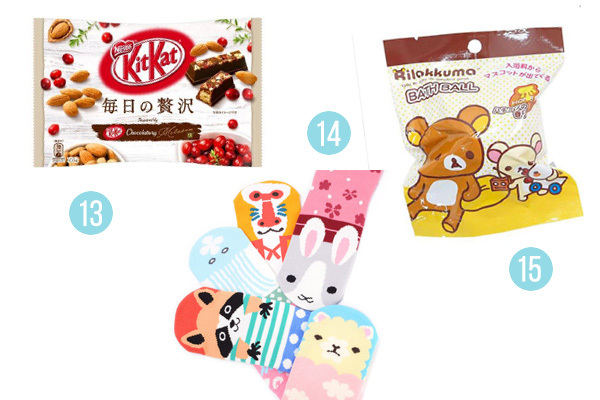 Nagomi animal socks [$4.99 Tokyo Otaku Mode] – Who doesn’t like cute socks? they have a variety of adorable cat and dog socks, too! 15. Rilakkuma bath ball with toy [$4.50 Jlist] – This honey-scented Rilakkuma bath ball would be great for anyone who needs a little kawaii R&R. Best of all, it comes with a cute toy inside! I hope this list was able to give you some good ideas, but if you’re still looking for more, you can always check out my gift guide from last year. Remember that since many of these items ship from Japan, I’d advise placing orders by the end of November to ensure delivery by Christmas. Thanks for reading, and happy holidays! Gahkthun of the Golden Lightning Giveaway for #EroGameMonth!